Interesting images that depict your point of view and represent the full spectrum of your work are important to being found online. Compelling images are more likely to be shared, and shared images help the SEO of your site. When you craft your portfolio, choose images with vibrant colors, angles, and interesting subjects. The metadata for your images is invaluable when it comes to being found online. Metadata is information about your photos that visitors won’t see, but search engines crawl to determine the nature of the picture. Optimizing images for SEO absolutely must include filling out the complete meta description, alt tag, and other meta fields for each image in your portfolio. Be strategic when naming images for SEO; make sure the alt tag and meta title for your picture describe it well in layman’s terms, such as “Los Angeles Art Museum” for an artistic shot of museum architecture in Los Angeles. Add titles or captions to your portfolio images. Not only does this help visitors better understand your work, but it enables search engines to identify the nature of your image and display it in appropriate search results. 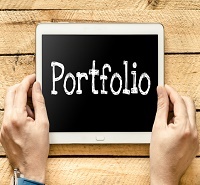 If you have room, provide a paragraph of content with each portfolio image. Relevant text can only help your SEO and allow your portfolio to be found. Every time your portfolio, or the unique URL to one of its images, is shared online you create a backlink. A backlink is basically any link that leads back to your site, and search engines reward sites with a lot of quality backlinks. Make it easy for visitors to share your images with Facebook, Twitter, and Pinterest widgets. If your images can gain some traction by showing up via links around the Web, you may see a sudden surge in visitors. If it takes too long for your portfolio to load on a user’s computer, a few problems arise. The visitor may navigate away out of frustration, which means she won’t see your portfolio and definitely won’t share the images. Search engines like Google may also penalize your website ranking for slow load times. Optimize your images by making them as small as possible without sacrificing resolution. Understanding SEO for images might feel like learning Greek, but if you take the time to optimize your portfolio the rewards can be substantial. Whether you are showcasing your work as an online resume or running an e-commerce site where visitors can purchase your pieces, optimizing your portfolio pictures means greater success and visibility for your work.